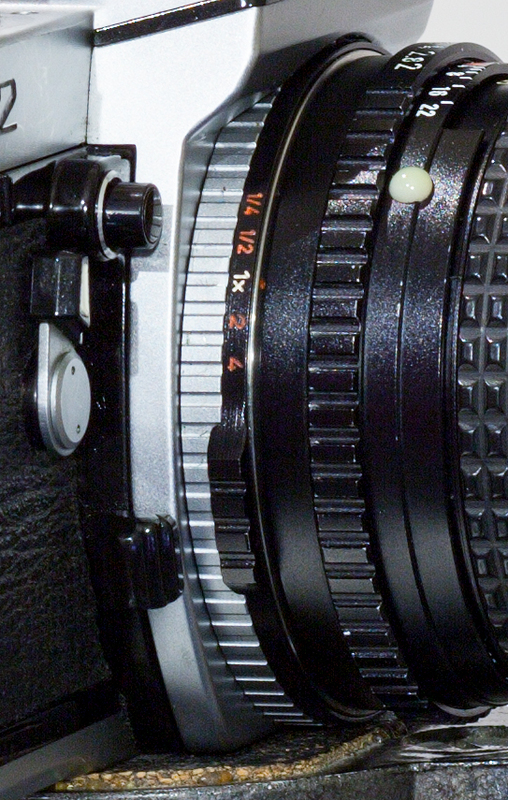 Pentax had been working with Zeiss on a joint venture that never really turned into anything, but the K Bayonet mount was the primary result of their work. Rival manufacturers had already introduced bayonet mounts, and it was clear that consumers wanted the greater speed and simplicity of bayonet rather than the widely used M42 screw thread. At the same time as the K2, Pentax introduced the KX and KM. In many ways the K2 seems a logical successor to the Spotmatic ES. 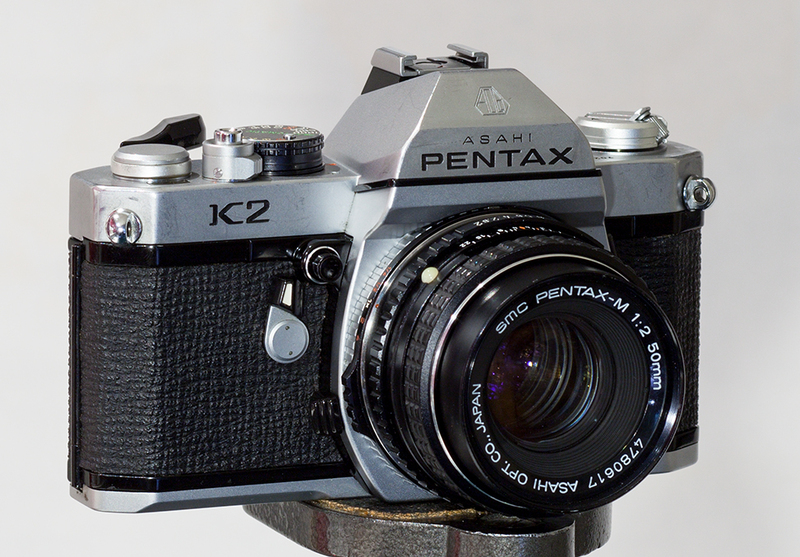 The biggest feature of the K2 was arguably the new K mount, Pentax’s first bayonet mount for lenses and essentially the same as is still used by their digital cameras today. 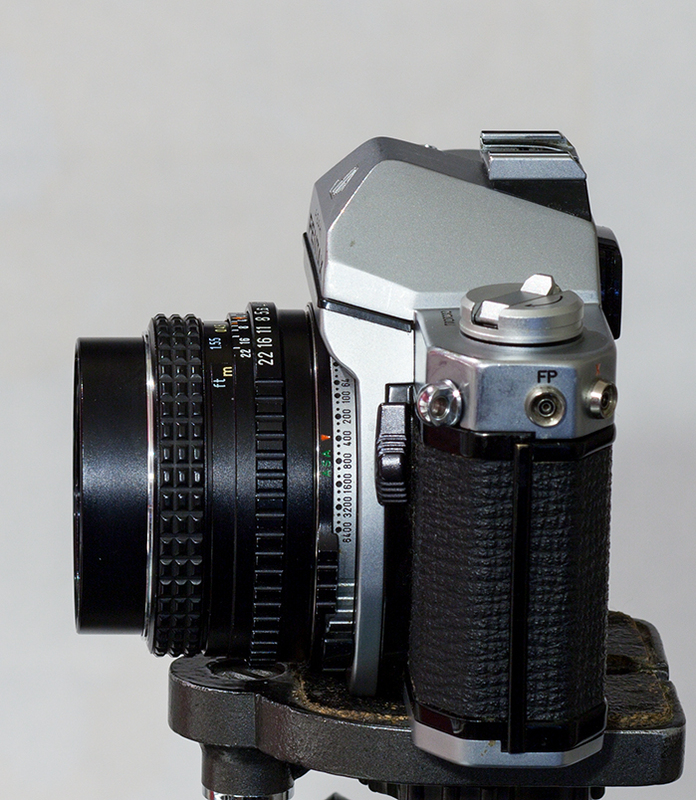 A desire to offer backwards compatibility with the M42 screw mount which preceded it lead to the K mount having a throat which was quite a bit wider than the M42 – in order to accommodate a screw-bayonet adapter. Happily this also permitted the design of much faster lenses than was previously possible, such as the 50mm f/1.2. 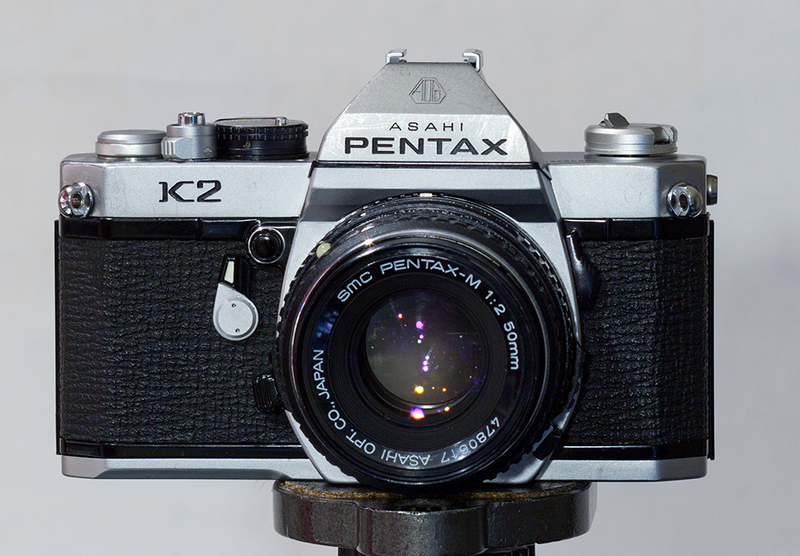 The K2 was the first Pentax to feature a vertical, metal bladed shutter; the shorter distance required when used vertically meant that the flash sync speed could be raised to 1/125th from the previous 1/60th. Body construction is otherwise pretty standard for the time, fairly heavy making extensive use of brass as had been the practice for years. 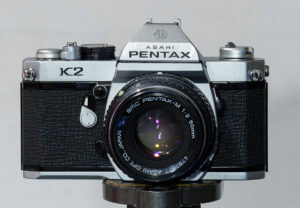 Unlike the Spotmatic ES, the only other camera produced by Pentax to have offered automatic exposure, the K2 had a full range of manually selectable shutter speeds – 8s to 1/1000th. The ES had offered manual selection only for speeds from 1/60th to 1/1000th. Also different from the ES is the method used to select film speed – and I can’t figure why they chose the approach they did! A ring sits proud of the body and carries the K mount; the edge of the ring is knirled and it is twisted to set film speed. Actually that makes it seem easier than it really is – it’s relatively easy to dial in exposure compensation, but quite fiddly to set the film speed. No wonder Pentax dropped this approach for all other cameras. 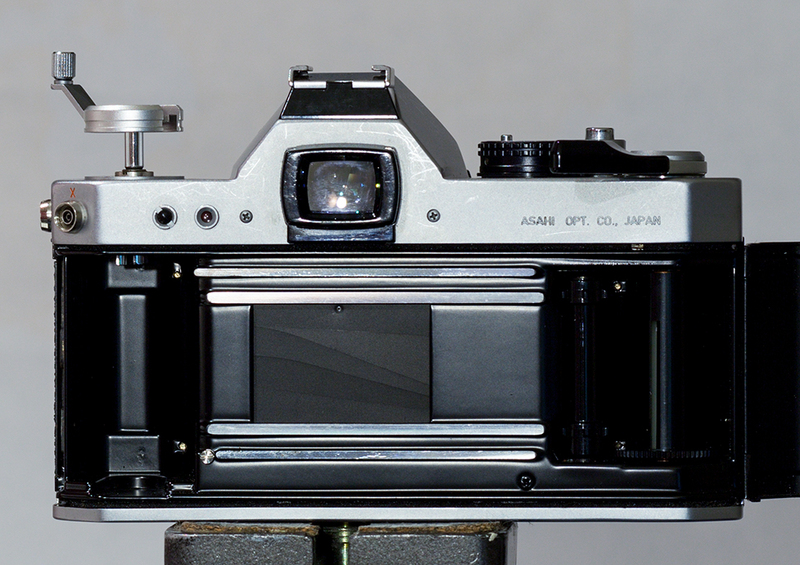 As befits the flagship of its time the K2 has wide open, TTL metering, with convenient DOF preview to the right of the lens, and mirror lock up to the left. Clockwork self timer is fitted, and focusing screens are interchangeable. 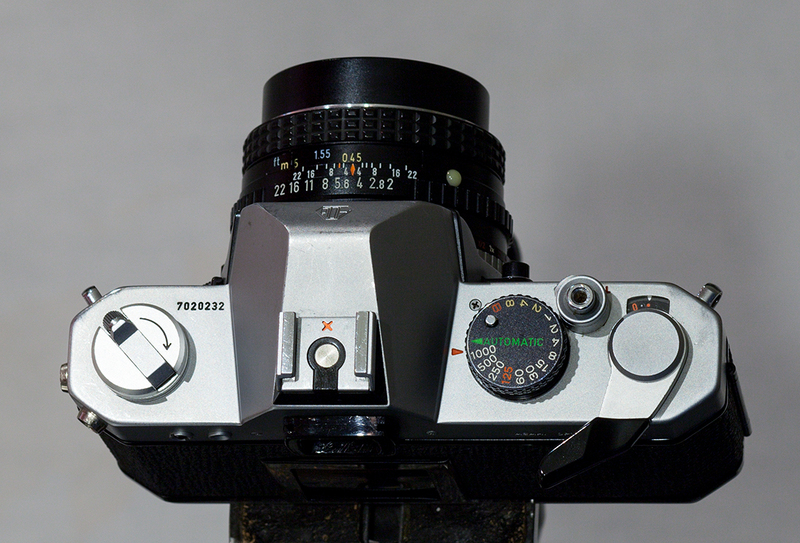 The K mount was a significant step for Pentax, and one that has stood the test of time. 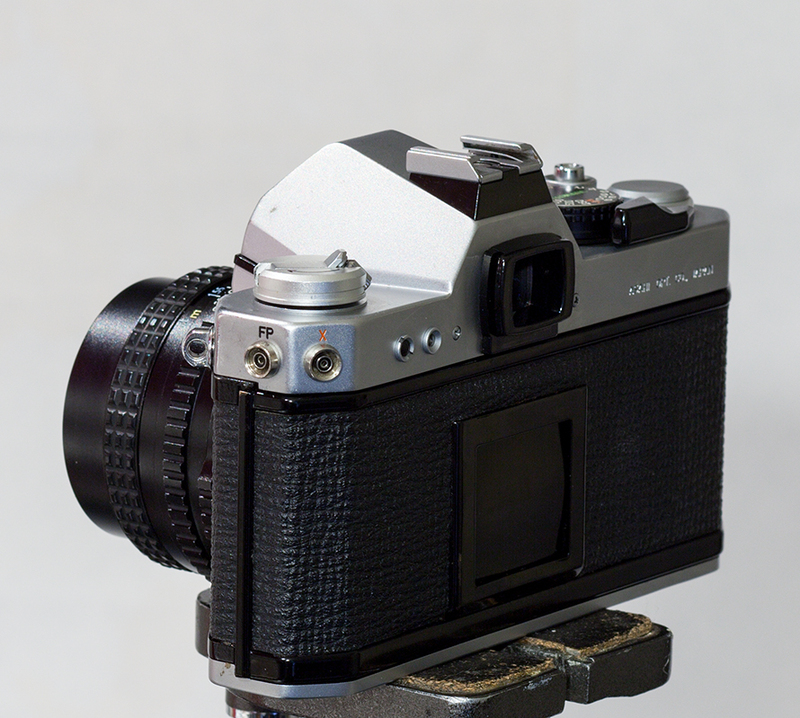 Of the three K mount cameras used to launch the new mount, the K2 is the most fully featured, even though it’s production run was relatively short as a result of the move to smaller bodies and the M series. Acquired December 2012 for $110 on eBay, it was a reasonable buy. The satin/chrome areas of the body show typical wear, but overall it’s in pretty decent shape for a camera that’s almost 40 years old.